This favorite take-out meal is so easy to make, and it’s packed with great flavor and color. It’s a healthy dish that’s perfect for Meatless Monday. Nothing beats the taste or color of fresh vegetables as part of a nutritious meal. 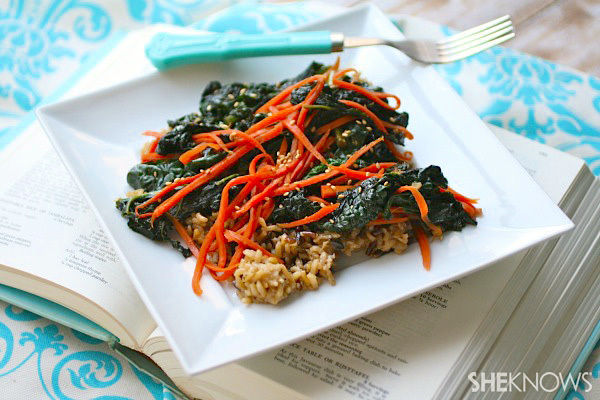 This Meatless Monday recipe for carrot and kale stir-fry is a great example! It’s a simple dish, but the flavors are amazing. This is a pretty dish to serve for company or your family. The golden carrots brighten things up against the dark green of the kale. If you’d like to use a prepared stir-fry mixture, you certainly could, but what I used here was easy to put together, and you can control the flavors you use. After washing and trimming the kale, tear it into large 4-inch pieces. To cut the carrots into spirals use a spiral peeler. If you don’t have a spiral peeler, you can julienne cut them. Set the vegetables aside. To make the sauce, combine the soy sauce, broth, garlic, ginger, brown sugar, vinegar, sesame oil, Sriracha and lemon juice in a bowl. Mix well to combine and set aside. Add about 4 cups of water to a pot and bring it to a boil. When it boils, add the kale, submerge it in the water and cook it for 2-3 minutes. Drain the kale and set it aside. Add the olive oil to a large skillet over medium heat. When hot, add the carrots and cook, stirring for a minute or so to soften them. Use tongs to add the kale to the skillet. Mix together. Add the sauce to the skillet and increase the heat. Cook, stirring, for a few minutes, then remove the pan from the heat. 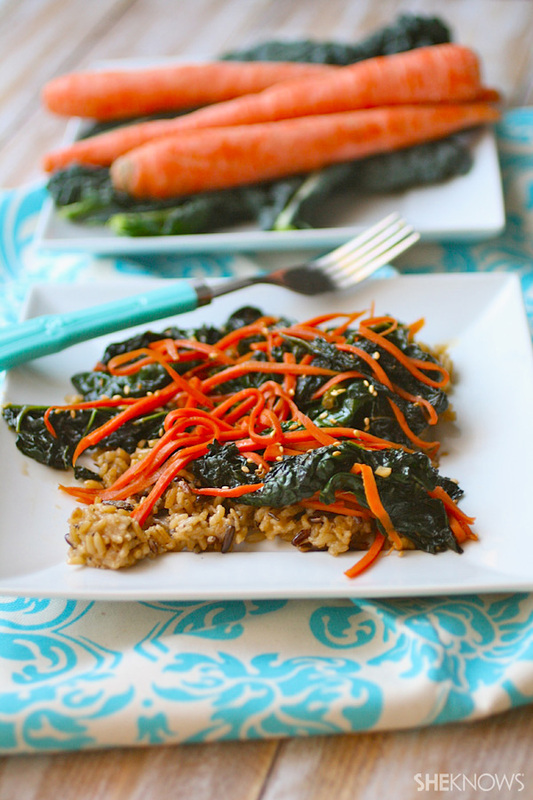 Add the cooked rice to individual plates and top each with the kale and carrot mixture. Spoon a bit of the sauce over the top, and sprinkle with sesame seeds. Serve this stir-fry for a lovely meal!